For a long time, being out at sea meant being out of sight and out of reach. And all kinds of shenanigans went on as a result - countries secretly selling oil and other goods to countries they're not supposed to under international sanctions rules, for example, not to mention piracy and kidnapping. 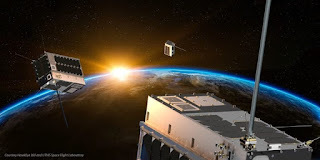 But now thousands of surveillance satellites have been launched into space, and artificial intelligence (AI) is being applied to the images they take. There's no longer anywhere for such ships to hide. In peace, we are on the cusp - with AI, big data, and the processing power to fuse multi-spectral data streams - of being able to get a very real comprehensive maritime plot. There are also a lot of things to ponder beyond just the visual range - but not on this net or this side of the SCIF. A note of caution - how much do we rely on them? How secure - both physically and access via the electromagnetic spectrum - are these satellites? If we lash our war plans to them - what do we do if they are not there? Sure, get excited, but also be careful. It is a dangerous world out there for the complacent, arrogant, and lazy.